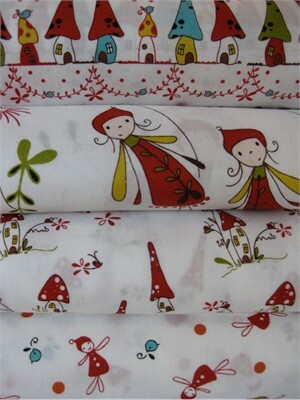 This week we're giving away 4 Fat Quarters of Natalie Lymer's Woodland. Everyone has a chance to win, all you have to do is leave a comment on this post answering the question below and you will be entered to win. The giveaway will end at 8:30am PST, Monday, December 19th. We will announce the winner later that same day. The winner will be chosen by random.org. 4. "Pin" this bundle on your PinterestBoard. Just click "add" on your Pinterestaccount. Then add the link to Natalie Lymer Fat Quarter Woodland Bundle, and add "Fabricworm - Natalie Lymer Woodland Bundle" as the description. I have already crafted pot holders, sewing kits, mini quilts, table runners and burp cloths. I am currently working on a small lap quilt for my son! Lots and lots of projects! I always make Christmas decorations. I am also making kitchen accessories , dog bed and possibly a few other items. I'm going to make a quilt for my grandfather and hopefully finish another quilt my mom started a couple years ago. I'd like to give it for christmas ! QUILTING A RED/GREEN/CREAM TABLE RUNNER FOR MY DAUGHTER, ALSO WITH SOME RED WORK DETAIL>SO FUN! Well finished - eyeglass cases, mini wallets, wristlets, key fobs and ornaments. Three quilts. Thanks for the giveaway! Merry Christmas! This year I am making stockings and a tree skirt for my family. Thanks for the giveaway! I'm a costume designer and I'm quilting my first quilt for my best friend! He's a lighting/sound designer and obsessed with Phantom of the Opera, so it's a Phantom of the opera quilt. It's tons of fun! I'm falling in love with quilting. In my opinion: Quilts are costumes for beds? yes. I am crafting papersnowflakes and candelmats. Thanks so much! I am making a few wine bottle gift bags for the holidays. I'm going to be making scarecrow like garden sculptures. I made a couple for a community garden and now have the bug! I'm doing table runners with matching fabric baskety things. Crafting a new holiday house. Recovering furniture. Making wall hangings. etc. I'm crafting some Christmas ornaments and a few mug mats this year. I tried to Pin this on Pinterest, but not sure that it worked. I tried three different times. I'll try again later. I've already finished my crafting for these holidays - I made a Matryoshka doll ornament for each person in my family. Normally I'm finishing things the day before or pinning a note on a half finished project promising to have it done by the end of January. Oh my word, let's see,,,a quilt for Steve, mug rugs for my mafia, mug rugs for Steve's posse, a wall hanging for someone I love, pj pants for everyone, t-shirt quilt, and and and well you know how it is, too many irons in the fire too close to Christmas. I am currently making some stockings from a panel I bought sometime ago. Thanks for this. I need to get on the ball but I'm making a wall hanging of stacked fiesta ware dishes for my MIL and a purse for my niece. Next year starts a whole new list! Gorgeous. Love it. I'm a follower. I have just finished making my baby boy a Santa Sack so Santa has the perfect place to leave his gifts. I've got three throw-pillow sleeves to quilt and finish (two holiday-themed for my home, and one to go with the recipient's den) and a Christmassy quilt destined for my husband's Man Cave that needs borders and quilting. No sleep til Christmas! And I do receive the newsletter! I haven't made anything for the holidays myself, and have assisted my mother in making a wonderful lap quilt for my niece's husband. All that remains is binding before Christmas Eve. I have already made quilts, mug rugs, pillows and a banner. Thanks for giving us a chance to win this awesome fabric. This Christmas? Not as much yet as I should!! Got a few pillow covers to do, a few boxy pouches, pin cushions... and a quilt... Aaaargh! I've made a tote, a zip pouch, 2 pillows, 6 lap quilts and a bed quilt. I started months ago, but I'm still trying to finish a few things! I'm on the email list. Thanks. Oh goodness- I've made pot holders, bags for the toys to go in, 2 table runners and a quilt. Not bad - my best crafty Christmas giving ever. I am making some needlebooks for my sewing friends. I already subscribe to your e-newsletter mailing list. Sadly not crafting much this year, although I have a little quilt/blanket under construction for my middle child who hasn't had one yet - poor middle child - hopefully that will get finished in time. I love this range, so cute for girlie things. I'm making napkins and placemats. I have already made my gifts, including a cathedral windows pillow cover. I am finishing up some mini quilts and little pillows stuffed with crushed balsam. I made 10 hats, a PSP case, a Kindle Fire case, two knitting bags, and a knitting needle holder. Now, I'm making MYSELF a pair of gloves, and made myself a new knitting needle holder for my dpn's earlier. Making lots and lots of crayon rollups! Great fabrics! My son and I are filling empty baby jars with treats and covering the cap with fabric. Not too fancy, but simple for him to make and give for gifts! I'm making minis for my 2 sisters - hope they like them. Great giveaway - thanks for the chance to win. I really need to finish some Christmas table mats I started. I'm making a years worth of bows for my nieces. I made bows for all of the major holidays plus some other cute ones, including one for the first day of school. So far for Christmas I have made two table runners, a day care bag, two softies, a minky blanket, a pillow case, two sets of counting bean bags along with sack to hold them...I think that's it. I'm on the mailing list for the newsletter! So far I've made two hats, two bolster pillows, a small purse and a quiet/activity book. I've been making table runners and Christmas stockings. Smaller projects, getting them completed. I'm making a big quilt, so the 4 of us could snuggle up together while watching the telly... As I am handquilting it, it takes some time, but I'm enjoying every minute of it. I am making champagne 'slippers' for the holidays! I'm making gifts for my sweet girls, cushions, bags and ipod cases. I wou;d like to make my sister a skirt but am quickly running out of time. This year I have gone overboard with crafting - 3 wall hangings, a table topper and 2 sewing caddys. I've surprised myself! I did tote bags as gifts for my daughters teachers. I made a couple of lined drawstring bags and want to make a couple more to give away and wrap presents in. Quilted trivets, of course! Have a super day! backpacks, zipper bags, totes, pjamas and dresses. thanks for the giveaway! I am working on 3 quilts right now to give as gifts. I would love to add this cute fabric to my stash! Taking a break from fabric to craft advent calendar activity sticks for our advent calendar. Popsicle sticks with something to do each day written on them - it eliminates the candy and toys - instead we do something together as a family. have also signed up for your newsletter. I am making love cuddles. A stuffed toy for all 5 grand children. I made quilted Christmas place mats, 10 quilt block ornaments for all the kids in my life, and next are 6 Christmas stockings! I really need to get going on those since I only have like 11 days! Calendar Tea towels, foxy boxers, quilted checkers game and more! I only wish I was crafting something this year. Instead, all my crafty supplies are packed away, en route to our big move. Does wrapping presents count? We made our own holiday stockings, and they rock! I made my brother a lap quilt and my mom a pouch for her Kindle Fire that I'm giving her. Teal towels, hand towels and lots of little teachers gifts. Finished a new table runner which I love, so I'm done with the Christmas crafts this year. Thanks for an amazing giveaway. I've been admiring this fabric! I would love to win this fabulous giveaway. Money is very tight right now and I am desperatly trying to get my business going. I make handbags, pillows, childrens apron, and scarves. I would love this bundle to make an adorable childrens patchwork purse. I did everything required. my email is burnsjulie@live.com and I am @juliemarieshop on twitter and juliemarieshop on facebook. I'm making ornaments and pot holders. Also, a baby quilt for our new baby, she is due on Christmas Eve! I bought my daughter a puppet theater so I need to make some puppets! I am doing glass etched wine glasses for my dad, wall decals for my brother, embroidery for my grandma, and a blanket each for my niece and nephew. i am making teatowels and hot packs and trivets and drawstring bags. Im making Decorative Balls for christmas decoration. I subscribe to your mailing list (hotmail account). Thanks for the giveaway! I am making hat and scarves! This year I am making stockings and Christmas decorations! I'm making a ton of things for Christmas; mug rugs, wall hangings, napkins, quilts. It's lots of fun. Camera cases, laptop bags, pincushions and if they get done I can try out an new cosmetic bag pattern. Oh there's work to be done and fun to be had in my sewing room. I am signed up to recieve your mail, thank-you. pajamas for more boys, purses for my nieces, and blankets for the babies. The sewing machine is tired. I'm finishing up two baby quilts. Just alittle bit of quilting on one and the binding on the other. I also want to make alittle sewing/needle kit but we'll see. Thanks for the giveaway and a chance to win some awesome fabric. Mini pleated clutches are my new craft present this year! I crafted some new quilted stockings for our family... everything else will have to wait for the new year! Hi , I am making a couple of christmas table runners! Christmas decorations with my 3 year old. Still hoping to make her a quick ballet bag for her stocking. I am making a holder for my daughter's crochet needles that will fold over and wrap up and tie! I've been crafting stockings. Lots of mini stockings. Now I just have to go out to pick up some small things to put into them. I made 7 Christmas table runners as gifts this year, and they were all started after Thanksgiving. And if that doesn't seem like a lot, I did it while taking care of my babies - one 2-year-old and one 6-month-old. Thanks for offering this giveaway! I already receive your email newsletter. Thanks again! I am already on the mailing list!! I am crafting origami trees with fabric and table runners as gifts. I am making table runners, tote bags and i spy pillows! thanks! i get the fabricworm newsletter! thanks again! I am making sets of napkins for different occasions.